Less than two days after defense attorney Larry Krasner accepted the nomination of his party to run for District Attorney of Philadelphia this coming Tuesday, he made a trip to Delaware County court. At court, Krasner had asked for a continuance for his client, Anthony M. Eubanks. Within a week, Anthony Eubanks would be dead. Radnor Township police had arrested Eubanks for harassing Tavonia Love, his former girlfriend, and breaking into the apartment where she had been living in 2016. He then strangled her with a dog leash. Eubanks smashed a glass panel near her front door around 5 a.m. on Nov. 10, 2016, the document says, and after getting inside, he allegedly wrapped a dog leash around Love’s neck and tried to strangle her. Love fought him off and Eubanks left, the document says, though he continued to vandalize her house before leaving, and police later found blood on Love, her clothes, the walls, the couch, and the floors. By the beginning of this year, Tavonia Love had relocated to North Carolina. But she had to come back for Eubanks’ court appearances since she was the sole witness to Eubanks’ rage as well as the victim. In May Tavonia Love had set up a stay in an AirBNB in Media to be near the Delaware County Courthouse. She traveled to Media and sat through the hearing where Philadelphia district attorney candidate Larry Krasner asked Judge Leon Hunter for a short continuance and to resume the hearing later, and Judge Hunter assented. Within two days from this moment, Tavonia Love was dead. 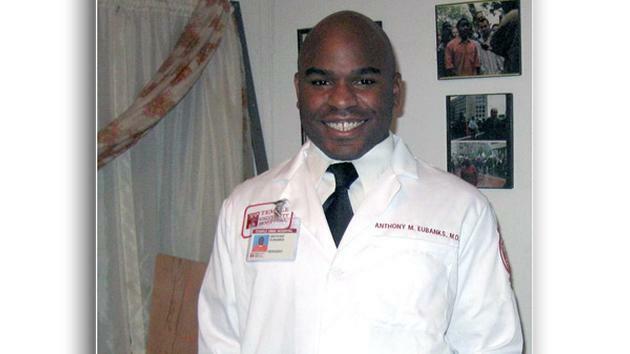 The Philadelphia Medical Examiner could not determine where Love died or how she died, but her body was found inside 2134 W Susquehanna Avenue, the house where Anthony Eubanks lived and where he was converting the ground floor into a medical practice. Shortly after Krasner appeared in Delaware County Court for Eubanks’ hearing, the house where Eubanks’ lived caught fire. Tavonia Love was found lying flat on a mattress in Eubanks’ bedroom, inside the Susquehanna Ave. house. The mattress is where the fire began. After the Philadelphia Fire Department had responded to the fire on West Susquehanna Anthony Eubanks shot himself in the head. I am probably going to be the last person that ever mentions Tavonia Love for all eternity after the four stories that ran detailing the crime. But her story speaks to the extreme difficulty of prosecuting domestic violence cases and keeping serial abusers away from their prey. It’s really interesting to me how outlets who follow politics like Philadelphia Magazine deliberately ignored this story that was surrounding Krasner’s client. And this isn’t just any old Krasner client from ages past—but an abuser who stalked, killed his girlfriend and then set fire to his own house to hide the evidence just days after Krasner had won the Philadelphia Democratic Primary. 6ABC made a one sentence mention. The Inquirer devoted two. All the time Krasner has been out on photo ops driving around in his TESLA, this trajedy was on the back of his mind, and he wanted to keep this under wraps. I suspect that the story of Tavonia Love had factored in to the Philadelphia Inquirer’s editorial board decision to endorse Beth Grossman for DA, even if they did not say it. The Inquirer approached Krasner to discuss Tavonia Love after Anthony Eubanks killed himself. Larry Krasner has refused all requests to talk about it. That’s sad, because he should. He should explain how his work keeping serial abusers and stalkers free helps criminal justice and the victims of domestic violence. Next: KRASNERBARS: What Happens To City’s Crime Rate Under Krasner?